“Park Chan-ok.” I had previously mixed her up with another one of my favourite, Park Chan-wook, the visionary director who made ‘Oldboy’ and ‘Thirst’, amongst others. She tries not to let the cancellation of 'Tamra Island' get to her. That was an phone exchange I had immediately after watching the film. I am writing about it now because I strikes me as odd how people are quick to mention a preference. Having preferences, making judgments and all that…it’s all perfectly fine with me, but with such judgments I would at least expect people to have some basis in making them to begin with i.e. have actually seen the film. It is something that irks me greatly. To me, though I tend to try and look at bigger pictures, it’s perfectly fine to run a film down to the ground, so long as you have solid reasons for it. Other people’s opinions shouldn’t really be the deciding factor. That goes for the opinions you read on this blog, too; while it’s difficult to completely block out the opinions of others, we should always make up our own minds, rather than have it made for us by others. For if that was the case for every film, if the word of mouth is really something that defines movies as much as the movies themselves, then ‘Paju’ would be sitting on top of the tree, unbudgeable, without any challenger in sight. It has had a lot of very, very good press, with just about every other person (other than the above, obviously) recommending it highly. 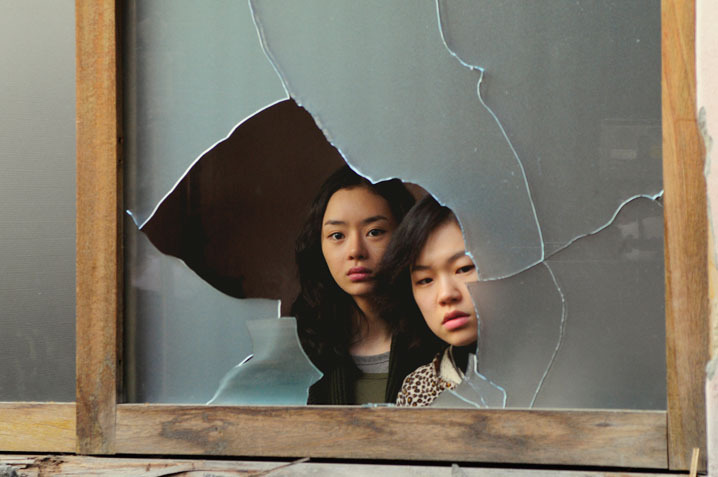 It even opened the recent Rotterdam film festival, an honour never before bestowed upon a Korean film (and there has been some fine ones in recent years). Her audition for the role of the schoolgirl was convincing. Joong-shik (Lee Sun Kyun) is a man on the run from the police. He has a lover, Ja-young (Kim Bo Kyoung), who he lives with, but after an accident with her baby, he decides to hotfoot it back to Paju (located just outside of Seoul), a place filled with bad memories, but the only place he could ostensibly go to. Here, he meets and marries Eun-soo (Shim Yi Young), a marriage that is short but had tragic consequences. It is a complex relationship, but it had nothing to compare with his relationship with Eun-soo’s younger sister, Eun-mo (Seo Woo). It is not necessarily a sexual or romantic one, but it doesn’t help to keep the neighbours’ tongue from wagging. The film then flits back and forth between the past (detailing his relationship with Eun-soo before her death) and the present (highlighting his struggle and protest against land developers threatening to knock down apartments). The relationship between Eun-mo and Joong-shik is made even more complicated by the fact that she suspects him of having killed her older sister. Suspicious alterations to her sister’s life insurance payout doesn’t really help things either, and it only serves as a prelude into the utterly complex relationship that the three of them share. Does it probably help if you understand that Paju itself is a rather contentious place in many ways? It is situated somewhere in the northern part of Seoul, and is in fact something of a buffer city between North and South Korea. As a result of its location, the American and Korean armies have bases in the area, and a train station called Dorasan could also bring you up to Kim Jong-illand if you really want to. In fact, I was just there some months ago, hosting a friend from Australia (who I think came here more for the chance to go to JSA rather than to see me, but whatever 🙂 ). I suppose it suffices to say that it is a place of great personal, public, and political contention. How much of this is an important factor? The film plays out generally in Paju, for sure, but there are other, more concise reasons for this film’s success. The acting has been praised by many, but I have to start out with the editing first. The film takes on several different styles, from the conventional reverse shots on sticks to a long-takes of phone conversations. The one constant that holds them all together is the editing; it’s not just the appropriateness of the angles, but also the length, the whole film cut together for emotion. Witness, for example, the a quick shot of a young child playing near a boiling pot of water. A cut to the mother, parents making love, and then you hear a scream of pain from the other room.It’s not meant to particularly inspire a lot of energy, but it does inspire a lot of emotions. The acting is great, but quite frankly, it is no use if a lot of it is edited away in the cutting room. A great contrast to ‘Goemon’, though I do admit they both have different purposes in mind. Having said that, while the editing is my favourite part of the film, I do think that if there is little to edit, then there is not much point to it, however nicely it is done. In this case, the acting worked perfectly. I absolutely love the pairing of the two of them together. I am not all that familiar with the actors, truth be told, but I do not think that they have done their careers that much harm here. The character of Eun-mo is not an easy, nor a conventional one to play. She doesn’t really cry all that much, to be honest, despite all the problems that she has had in her life up till that point. It does mean that when they do flow, they actually mean something. This calls for a lot of reserve on her part, because the usual reaction in Korean films (and films from many other countries, in fact) is to have the female character wail and wail at one point of another. Is it a reflection of the hyper-femininity that is on display within Korean society itself? Perhaps, perhaps not. What I’m trying to say here is that many people play up to the role that is expected of them, rather than being precisely what it is that they want to do. Eun-mo does neither of that; her foray into a nightclub, early on in the film, suggest someone who does what she wants, rather that what others necessarily want her to do. As she grows up, however, she had to maintain a facade of reserve, a certain coolness and maturity. She was more than just a little emotional when she had to go over her sister’s death once again for insurance purposes, but she maintains her cool and keeps her emotions in check. Then again, when you think about it, this could also be seen as a form of display, an insistence to do what society deems to be mature, rather than to actually stay true to one’s instincts. Look at it in whatever way you will, but ultimately the performance of the actors here is one that is greatly differentiated from a lot of other movies I have seen. That balance between maturity and innocence is a difficult one to achieve, and I think she did a fine job here. It reminds me of ‘An Education’s Carey Mulligan, and I’m emboldened enough to claim that had this film been an American one, it may well have shot Seo Woo into the Oscar territory. I talk about Seo Woo the actress a lot, but attention must also be given to Lee Sun Kyun. His is a journey that I am not sure about.Can I accurately describe him as the protagonist of the film, the one who the film is actually about? His is a journey that is filled with guilt; it is telling that when the infant had boiling water dripping on her, the director decided to stay with Sun Kyun comparitively more, capturing his emotions and reactions for posterity. The Christian imagery within the film also suggests his journey of looking for redemption, characterising a man who, while he has made many mistakes, is essentially good at heart. The latest Head and Shoulders advert was low-budget. Is he instead the antagonist for Seo Woo, the one who is merely a foil for her? Could it be both? There is no rule, after all, that particularly states that one is exclusively the protagonist or antagonist. In any case, they both fulfilled their respective roles for each other, and it is the symbiosis, the ambiguity, the drives the film. Is he in love with her? Is he merely loving her as his sister-in-law? When he is worried after she tried to run away from home, is it borne out of brotherly love, or something more? When he hides facts about her sister’s death from Eun-mo, is it an attempt to protect her from herself, or his relationship with her, fearing that she might yet try to run away? It is somewhat telling that he spends a lot of his time protesting against the knocking down of old buildings against new development. The buildings are old, the people have all moved away, and yet there he is, leading a group of people who tries to fight against it. Is the fact that he is fighting against these new developments a reflection of his own attempt to keep the past alive? The film, as a whole, absolutely thrives on this ambiguity, one that won’t quite make itself all that clear until the very end, and even then, you still have a bit of space to make your own reading. In conclusion, I have to say that it is these very spaces that makes ‘Paju’ a very worthwhile film to watch. You are free to make your own mind, and in a way, I suppose the film expects you to do exactly that, in a mature way, to decide who is the film truly about, what it is truly about. It takes a few twists and turns here and there, jumping back and forth between the past and the present (which, I have to admit, still somewhat confused me at times. I don’t know why, even though it is clearly labeled as such). Whether what I said is true, though…I’ll let you make up your own mind on that. Fikri just finished two cans of Pepsi…in a row.